The open road lures you into kick-starting your bike and setting out not to reach a destination but to enjoy the journey. When you are possessed by a fiery sense of wanderlust, there is nothing more exhilarating than to make a road trip and get lost somewhere in the middle of nowhere. Before you set out for a road trip, you ought to ensure that you have everything that would keep various kinds of problems at bay. Breakdown supplies: If you’re going to be camping in the night, a flashlight is extremely important. Bring along with you an extra flashlight and fresh batteries. Emergency supplies are very helpful in finding your way if in case you are lost. First Aid Kits: Road trips can be extremely adventurous and this brings into the picture the risk of hurting yourself in a number of ways. You may slip or fall or have a bad headache and therefore it is always a good idea to take along with you a first-aid kit comprising of items like nicks and scrapes, anti-bacterial cream, bandages, pain killers and medicines. Music: Don’t forget to bring your favorite outdoor speakers along with you. The joy of riding is multiplied ten times when you have your favorite artist playing your favorite songs right in your ears. 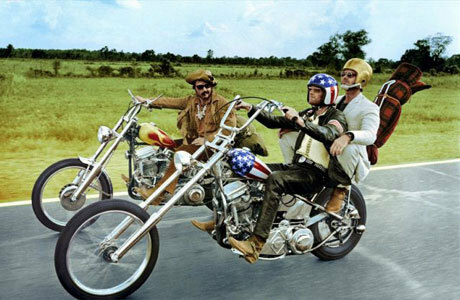 Some tried and true songs that you can take on the road can be – ‘On the road again’, ‘where the streets have no name’, ‘easy rider soundtrack’, ‘pocket full of sunshine’ and ‘take it easy’ by the Eagles. Camera: A working camera would help you capture the memories of the trip and cherish them for the rest of your life. If you are going in a group, a couple of cameras would be more than enough. You want to travel light and when in a group, it would make little sense for each rider or pillion to carry a camera each. There is nothing like capturing the scenery that makes up the fantastic background for the road you’re traveling. Eatables and juices: Fruit juices help you stay hydrated and staying hydrated is an important aspect of any trip. It is always a good idea to take along with your food items that are sources of quick energy. Fruits, pretzels, granola bars, and crackers are food items you can take with you without having to make much space. A road trip on a weekend can be a stress-buster that can bring you back Monday morning fresh and in good spirits. The thrill of a road trip is addictive and once you make a few trips, don’t be surprised if you get itchy feet every weekend after. People have started making an active move towards biofuel. What is biofuel? This is the when you recycle waste vegetation or oil, you would have to make use of the biodiesel filters, in order to make biodiesl. The engine has to be protected and looked after during this process you have to be aware that there are different filters that are used for various applications. The properties that are involved in the process of biodiesel is one that you should be very aware of. Let us take a look at this in more detail and also be sure that the biodiesel filters that you are utilising is one that suits your requirements. There are so many different types of technologies avaible. New things are being invented all the time. We try to conserve things that is why biofuel is the way to go. Even if you are out hunting, you should try and use items that do not benefit you too much like different sights. The elevated temperature properties, the main thing here is to be aware that any filter media can be used in this process; this means the filtration of water-bases. If however, you are filtering warm oils, resins and other products that is of a high temperature, you would have to use a filter that is able to withstand a high temperatured product that is been filtered through it. You have to bear in mind that if you are filtering any substance through a filter of this nature, the filter does have to suit the substance that you are filtering, this is vital. The road to good filtering is that the containments should be able to be filtered out in order to make your biodiesel a product of high standards. This is something that would grade you as well as the standards that you set. There is a micron rating that is set within all the filters of this nature, and the determination of the sort of filter that you require is set on the size of the microns that you intend on filtering out. There are biodiesel filters that have a rating of five, this is said to be used in all aspects of biodiesel filtering. The withstanding against solvents, alkaline solutions, as well as acids is what a filter of this nature has to be up against. If you are using a filter that is of a lesser standard, you are sure to find that this might break once exposed to the chemicals of this nature. That it is why the importance of the filter does depend on the quality of the biodiesel. Biodiesel is one of the hydrogen-fuels, and overtime have become the most popular replacements to petroleum fuel. This is one of the reasons as to why many are stopping the use of all fossil fuels, the main reason been that they are wanting to save the planet against existence; this has to be the most important reason. Biodiesel Filters, if used correctly, is known to produce the best quality of biodiesel known to man. The importance of using the correct filter to match the containment that are been filtered is one that you have to look at and pay attention to. It is best to know what you are filtering before you go out and get the incorrect filters. Biodiesel is non-hazardous; this is the important factor that you have to bear in mind. Parrot has never been afraid to push the boundaries when it comes to drone design, with rovers that jump through the air and miniature quadcopters that scale walls. The Disco revealed at CES earlier this year is yet another departure from the typical consumer drone form, and Parrot has just revealed a few new details about how the speedy fixed-wing glider will work, along with details on pricing and availability. Parrot says that Disco will be available from sometime in September with a price tag of US$1,299, with the Sky controller 2 and Cockpit glasses included, inside the drone case with wheels. With their incredible agility and maneuverable cameras, quadcopters have ruled the consumer space about unmanned aerial vehicles. But fixed-wing versions have their place too, with these types of gliders taking to the skies in the name of crop monitoring, wildlife conservation, deliveries, and surveillance. With its Disco drone, Parrot is trying to bring the strengths of this design to those who simply like flying for fun. This makes for an ultralight, 725 g (1.6 lb) drone crafted from expanded polypropylene that can fly for 45 minutes at a time, compared to the 20 to 25 minutes most top-flight consumer drones will run for. There’s also the matter of speed, with the Disco able to fizz along at 50 mph (80 km/h), while most quads, including Parrot’s own Bebop 2, top out at around 37 mph (60 km/h). A few impressive specs here and there is all well and good, but what might really make the Disco unique is the experience of flying the thing. The first-person view (FPV) capability, where a camera built into the nose live streams the drone’s view back to a set of virtual reality goggles, has been a major factor in the explosive growth of drone racing, and Parrot will be hoping this immersive sensation can have a similar effect here, hooking hobbyists by making them feel like they are right there in the cockpit. Alongside the Disco drone, Parrot is launching a set of FPV goggles called Cockpit glasses that work in a similar way to the Samsung Gear VR headset. Pilots slide their iOS or Android smartphone into the headset which hooks up with the drone over Wi-Fi and displays live vision from its full-HD, 14-megapixel camera with radar and flight data laid over the top. There is also an onboard computing unit called C.H.U.C.K (Control Hub & Universal Computer Kit), which handles the Disco’s autopilot capabilities. This allows users to simply toss the drone into the air like a frisbee for take-off, which sees it ascend to an altitude of 164 ft. (50 m) and circle automatically until the pilot takes the joysticks. When it’s time to come down, the automatic landing feature brings Disco down below an altitude of 19 ft. (5.7 m) and slows it down to land smoothly in a straight line. The drone is controlled with the newly announced Sky controller 2, the second generation of Parrot’s remote control for drones. This allows Disco to roam up to 1.2 mi (1.93 km) away and connects with the dedicated Free Flight Pro smartphone app to enable the FPV streaming, along with functions like geofencing, limiting altitude and recording video onto the drone’s 32 GB onboard memory. There are times when we are possessed by a wonderful sense of wanderlust. For some, the sense of fernweh is constant though out their lives and a motorcycle does everything to take us places that we dreamt of going to. The list of places never comes to an end and it is journey that gives us the pleasures that we seek. The urge to explore is in the blood of those who choose to lead life on the road. Biking gear: Make sure that you have a proper biking gear. Worn out gear may be a hazard and it is always a good idea to get your gear in place – a helmet, pair of gloves, a jacket and a light backpack are the primary ingredients of a typical gear kit. First aid kit – The journey through rough roads is not a surprise when you set out for bike trips and a first aid kit always comes in handy in case of a mishap. Torch: There would be times when you would need to camp at the most unexpected places in the middle of nowhere. In such a scenario, finding your way without a torch can lead you into a lost trail and it may take hours for you to find your way back. A torch and working batteries would always come in handy. Laser Range Finder:A device like this one of the modern devices that seems like a great help for travelers. A laser range finder in your bag would help you make better decisions if you are out in the wild. It will help you get an estimate of how far you are from a certain target. A Nikon ProStaff 3 Laser Rangefinder would be an ideal fit for bikers. Your kicks: Protect your feet with the right pair of shoes. You would want to wear shoes that are sturdy and can take the work load of shifting gears and pressing the brakes for a long span of time. A good pair of shoes also saves your feet from slipping and can help avoid major accidents. A Complete Check-up: Not only does your bike need a complete check-up before you start your journey but your body does too. In order to keep medical problems at bay, you should be aware of any problems that you might face on the way. Take your medication along as well. It is also advisable to keep working out regularly if you wish to do a bike trip any time soon. This would help you stay alert and less fatigued on the road. A good road trip is all about taking the right safety measures. As you gain experience out on the road, you get better and learn the tricks of the trade. So you’re looking for driving gloves. You hear the call of the road, but you’re tired of your hands getting cold or wet. Well, then you’re on the right track – driving gloves is what you need. This is especially true if you have a motorcycle or a convertible sports car. The hands are usually the first to get cold when you’re driving and if they get cold you can begin to find yourself unable to control the motorbike or even the car as much as you should. Gloves not only warm your hand but also give you the grip you need, which means they work well even in hot weather. On a motorbike especially this is something you should keep in mind. So What Kind Of Gloves Are You Looking For? You will find the right riding / driving gloves come in an array of materials, such as cashmere, satin, or leather. Leather is great not just for driving or riding but for many other everyday uses too. Cashmere is great for really cold weather. Gloves are often also made with a combination of these materials, leather with cashmere or satin, and so on. Cashmere lined leather gloves are a great example of the two materials being put together, with the inside of the glove being cashmere. They are tough on the outside with great grip, yet comfortable and warm on the inside – a perfect combination, especially for cold weather. One of the great things about these gloves is you don’t have to go through too much effort to get a good pair. The Internet has plenty of online retailers from where you can buy a pair straight away. Large clothing shops usually stock a wide array of gloves that will work as riding or driving gloves. Obviously, you can try them on at a clothing store to ensure your size is correct but if you know your size and what you want, buying on the Internet is convenient. Surprisingly, buying a pair of white cotton gloves for negatives from a photography store, cleanroom gloves, vinyl medical gloves, or other sorts of gloves such as these will even work well in terms of getting you grip. But a pair of vinyl medical gloves is not very fashionable to wear with your suit. You could think of getting these quickly if you’re planning on taking your ride out on a quick spin. Even disposable food handling gloves would work. But when it comes to the real deal, natural leather is almost always better than genuine leather when riding a motorcycle. This is because they last much longer than genuine leather, and if you intend on using your gloves regularly you may have to buy a pair every year, should you go for genuine leather. But obviously, a lot depends on affordability. If you buy a pair of ‘knuckle gloves’ (where there are holes from the knuckles) then, while they may give you excellent grip, they are not going to keep your hands very warm. These aren’t really the best driving gloves to wear and one should rather consider getting proper gloves if you wish to enjoy your driving experience. Travelling can be a little rough on the body and lead to pain. The most common travel ailments are back and neck pain issues. Travelling via any mode takes a toll on the back and neck because of the sitting/inclined position. Prolonged sitting position leads to back and neck pain which caused a lot of discomfort for some days. When it comes to travel, one thinks about the luggage to carry. Many people believe in “traveling light” and take the essentials so that the weight is not too much for them to carry. Heavy bags lead to strain in muscles which cause back and neck pain. If you are carrying a shoulder bag then make sure that light weight items are stuffed in that. Carrying a shoulder back for a long period of time can lead to pain in the back and neck. There are ways which one can adopt to minimize the damage caused by the travel to the body. The ways vary based on the mode of transport that is being taken to reach the destination. But the most common method that can help in reducing back and neck issues is stretching out by taking a break. Whether in car, airplane, train or ship one can always get up and stretch out the muscles to release the tension. Stop at regular intervals to stretch out the muscles and do some basic back and neck exercise. Air travelers are more prone to common travel ailments like back and neck pain. One should carry a back and neck support to get the correct posture. Make sure that you do not sit for a long time in one position as it will take a toll on your back. Make sure that air ducts are not directed over the head as it can cause tension in the neck muscles. Bikers have many more problems than car riders due to the posture that they must keep during a ride. Slouching is often the main problem for many bikers as they get fatigued on the road. Back strengthening is a key component to any exercise program and it is a must to keep good riding form on long distance rides. Many bikers use weight training, inversion exercises, and yoga as ways to combat bad posture on the hog. Read some inversion table reviews if you’re interested in getting one of those – they’re an investment well worth making. Irrespective of the mode of travel, posture is the main cause of back and neck issues which should be kept in mind. There are back and neck support that are available in the market which can be used to minimize the pain. By following basic steps one can reduce the common travel ailments and have a happy and pain free travel! If you are looking for a better option for working on your bike, then a motorcycle table lift is the answer. Buying a used motorcycle table lift can be more cost effective as a new lift will be quite expensive. A motorcycle table lift or a motorcycle lift table is a table that has been designed to handle motorcycles. They were basically developed for lifting a motorcycle off the ground, so that the owner or mechanic doesn’t have a problem checking on or repairing it. Motorcycle loading ramps are different and should not be confused with table lifts. Motorcycle owners would probably swear by table lifts as the best way to deal with any repairs to their bikes or simply to clean them. The lift tables are usually made of steel and are powered by hydraulic air cylinders. A motorcycle lift that is powered by a hydraulic cylinder is called a hydraulic motorcycle lift. One of these lifts can generally handle a load of 680 kg. If you are planning on getting one of these lifts, you will need to consider where to store it. Most people won’t have space in their garage for more than one car and a motorbike (if you are lucky); whereas some owners will just use the lift as their bikes parking spot, when lowered to the ground, the table fits perfectly under a pick-up truck. Electric or scissor motorcycle lifts are not exactly cheap; however, once you have worked with one you will never want to work on the oil stained floor again. If money is not an issue, then a new model such as the SAM 1000 is an excellent choice, but if you’re strapped for cash or simply would rather spend the money on accessories, then motorcycle table lifts or making your own one is a better option. The height of any table lift, whether new or used, can be adjusted and once you’ve set the table to a height suitable for you, doing major repairs is nothing but a pleasure. If you own a lawn tractor, an ATV, snowmobile or other fun toys with a wide wheelbase, an extension might need to be added in order for them to fit on the table lift. A shorter motorcycle is able to fit onto a longer table, not the other way around, so an extension is usually a good idea. In addition, if your table lift has wheels, then rather than using a dolly jack, you can simply lift up the table at one end (keeping the wheels on the floor) and roll it like you would a wheelbarrow. If you enjoy doing your own repairs, then you will love owning a motorcycle table lift. Motorcycle table lifts are well built, strong and will likely last forever; not forgetting their ease of use. Whether you choose to splurge on brand new lifts, purchase used motorcycle table lifts, or make your own; a little oil and some grease are all that’s needed for maintaining your motorcycle lift.